To speak with Soul 2 Soul Sisters about reparations giving, please contact us at info@soul2soulsisters.org or call us at 720-295-4876. 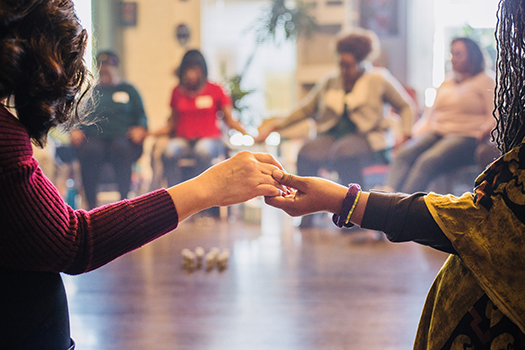 Reparations as economic justice and healing justice are interwoven in Soul 2 Soul Sisters’ racial justice approach. In all of our anti-racism work we more deeply explore the United States of America’s multigenerational reality of slavery, historic and present-day systemic racial plunder and discrimination, this country’s racial wealth chasm, we discuss those realities and many others all while synchronously engaging in African healing ritual and discussing reparations as right and righteous. Acknowledgment of the horrendous sins committed by white people against Black people historically and presently – as America continues it's addiction to free-labor on the backs of Black people, Brown people and historically marginalized people. Apology for the horrendous harms committed by white people against Black people historically and presently. Compensation that includes money, universal health care, universal education, employment and more. Conciliation – Plans for cultivating mutual, endearing, egalitarian relationships with Black people toward building hospitable and just systems and communities. We hope you will take time to listen to the CPR reparations segment. May we all experience some level of encouragement and commit/re-commit to ending anti-Black racism using approaches that center acknowledgement, apology, reparations and healing practices.